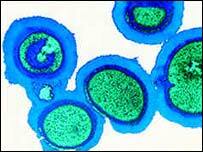 A nursing chief has urged patients not to stay away from hospital for fear of catching MRSA. A Royal College of Nursing representative in Leicester said people were cancelling treatment over fears about contracting the bug. The University Hospitals of Leicester NHS Trust said MRSA cases were falling. Pauline Tagg, of the trust, said: "I would be concerned if people were cancelling their operations because they were frightened." Jean Thornton, senior staff nurse at Leicester General Hospital and local RCN rep, said she had taken a number of calls from patients who claimed they feared catching MRSA during a hospital visit. She said: "One woman called me and said her father wouldn't be coming in because of infections. "This has become a real problem. People are so frightened they are telling us they will cancel their operations, which is a concern because they are putting their immediate health at risk." The trust said while MRSA infections at Leicester's three hospitals have actually fallen, the national debate over the bug had apparently deterred some from having treatment. Ms Tagg said: "I would reiterate the message that people should not stay away for fear of picking up an infection."